Among the elderly, there is often a need for certain types of home medical equipment, which helps make it easier and safer for the senior to live independently. These types of durable medical equipment are designed not only to make life easier, but also to improve the ability of the senior to preform the essential activities of daily living(ADL.) There are a number of different types of equipment used, but to prevent falls and improve accessibility, the stair lift often leads the way. The stair lift is a device that is intended to make it easier for a senior, or other individual with limited mobility, to safely use the staircase. They run the length of the staircase and provide a chair or platform that can transport a single user along the staircase. Typically, the track, which is made of a light weight metal like aluminum, is attached to the steps of the stairway, but some are also attached to the wall or banister. In the case of wall mounted stair lifts, this is usually done in areas with limited space or if the staircase is curved. The most common types of stair lifts use a chair, as opposed to a platform, as these types of stair lifts are the safest and easiest to use. 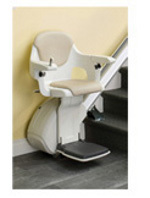 Often referred to as stair chairs, these types of stair lifts ensure that the senior remains seated as the stair lift moves, with most offering seat-belts and even chest restraints if needed. Perch lifts, which are also sometimes called standing stair lifts, are less common and require that the user stands upright as the lift moves up the stairs. The perch is basically a small platform that is large enough to stand on, but not much more. Some perch lifts provide a place to lean the hips against and all provide hand rails, but they are still not as safe as stair chairs, because the user must stand upright as the lift moves. While for most, the stair chair is the best choice, as there is less risk of a fall, some elderly patients who have experienced a serious hip injury or even a hip replacement, might find a sitting stair lift difficult or even impossible to use. So, in these types of situations, a perch lift is often a better choice. A perch lift can also be a good choice in homes that have limited space. Battery or Electric, Which is Better? The other main decision when buying a stair lift is choosing between a DC Stair Lift and an AC Stair Lift. In the case of the former, the DC Models, the stair lift is battery powered using one or more rechargeable batteries. This provides an extra layer of security, as in the event of a power disruption, a DC Stair Lift can still be used. AC Stair Lifts on the other hand are not battery powered, so if it looses power than it can not be used. They do, however, cost less than DC stair lifts, with DC stair lifts not only having a higher upfront cost, but also requiring that the batteries be periodically replaced. One other important factor that affects what type of stair lift can be installed is the design of the staircase. If the staircase is straight, than it is usually easy to find a stair lift that will work with the staircase. There are a number of Do-It-Yourself Stair Lift Kits available and the main measurement required is the length of the staircase, as the track must be cut to the length of the staircase. For non-straight staircases, the stair lift will cost a little bit more and it might not be able to get a do-it-yourself stair chair kit. For actual curved staircases, which aren’t as common, a completely custom stair lift track will need to be made, which is quite expensive, easily 500% more than a regular stair lift. However, for staircases that have ninety degree bends, which makes them “L” shaped, there are a few rather inexpensive options. There are even stair lift kits that will work with staircases that have a landing, so providing the staircase is not circular or curved, it is usually not difficult to find a stair lift kit.